"Great book." "Perfect time." 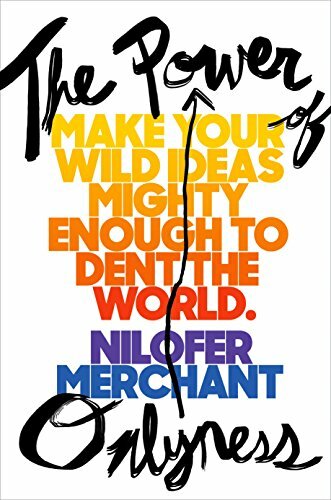 I expect these are the phrases I'm going to hear a lot about Nilofer Merchant's new book, The Power Of Onlyness: Make Your Wild Ideas Mighty Enough To Dent The World. "Great book," because it is. This is an actionable book filled with stories that would have made you glad to read them even if they didn't teach you something. "Perfect time," because of all the conflict in the world and how we need to deepen our discussions around many of the things we may have let slide before. Perhaps, perfect timing for me as I embark upon a new set of adventures around my research, speaking, and consulting. My research is about the mixing of human, technical, and organizational dimensions of work. This book is a deep dive into the human -- and particularly, your own -- contributions. Until talking with Nilofer about the idea of onlyness, I’d never thought as deeply about the unique contribution that each one of us can make. Only I can stand in this particular spot at this particular moment. Yes, my science fiction loving-self could challenge that, but even there we could have some interesting insights about that. Onlyness is more than finding your passion. It’s about exploring your opportunities to contribute. The book offers examples big and small. It also helps you focus on the evolution of onlyness. My first goal is to assess how I can further develop my onlyness. I want my place in the world to be more than happenstance. We have an extra gift in Chapter 3. Merchant, an MBA alumna (and now my colleague and friend), chronicles Prof. André Delbecq’s story of onlyness. Though I’d been honored to know André for more than 16 years (we lost him to cancer this year), I did not know how much work it took for him to stand in his particular place in the world. André was one of the wisest people I’ve known and this chapter is a unique view into the evolution and enactment of that wisdom. Like most great books, this is a call to action. It's a call to collaborate. The quote from p. 2 continues, “Now that you can grow and realize those ideas through the power of networks, you have a new lever to move the world.” More than ever before we have the chance to find and work with others to make dents in the world. As I write this, it seems that more than ever before the world needs us to make positive contributions. Make your ideas mighty! Disclaimer: I received a free galley copy from the publisher and a gift copy from Nilofer. My purchased copy from Amazon arrives today.